Wool E.’s going on the D.L. He’s day-to-day. We’ll see how long it takes him to get back. During the first game of the series the Mud Hens dissed Wool E. Bull by tossing cups of water at him as he came by their dugout. That continued into the second game. Wool E. escalated at the bottom of the 1st last night by dragging a rubber Mud Hen around on the end of a leash. The Mud Hens retaliated with water balloons as he came by their dugout, but not all of them broke. Wool E. picked a couple up and threw them back into the dugout as Mud Hens cowered in the back. 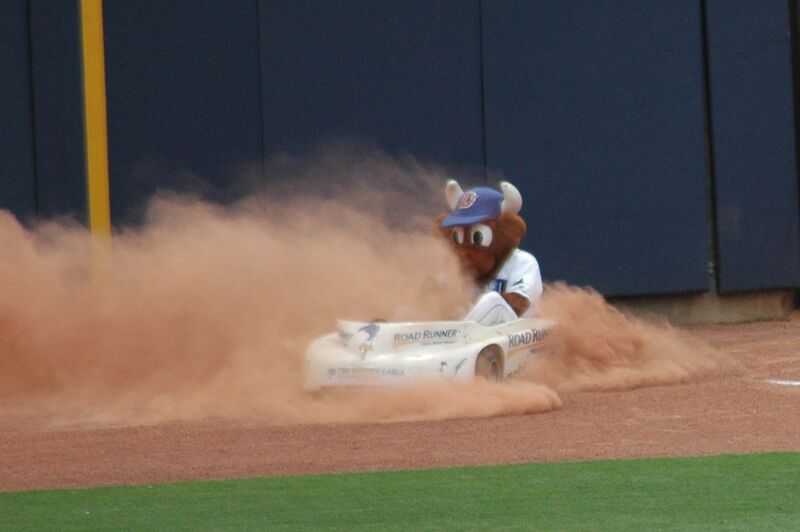 But then Wool E. slipped on the grass and went down and — was actually hurt. It took a while to realize that and he had to be helped off the field. Looked like a twisted knee. Fortunately, he was back walking and dancing around the stands later in the game. Unfortunately for the Mud Hens, they did not get the steak dinners promised after the bus got them to the DAP late on Monday night. The dinners were sent to the Bulls clubhouse instead. See Herald-Sun and Indy Week stories for more details. Oh, yeah, the reason we were there at all was to watch a baseball game. In a switch from earlier games we got a very slick pitching performance from a starter. Richard De Los Santos pitched a very credible 5 ⅓ innings. Ekstrom, Bateman, and Abreu kept the door shut. Angel Chavez bounced one off the top of the centerfield fence for a double in the 4th, then got it over at almost the exact same spot in the 6th. He had his best night in a long while with 2 RBI. Nice balanced attack overall with homers by Chavez and Shealy, doubles by the Johnsons and Chavez, and thirteen hits overall. No more fresh info on Jeff Bennett’s release or Hank Blalock’s future. Nor have we seen any info regarding the Bulls starting pitching situation. We remain one short and then there’s Heath Phillips. We have not heard a thing about Jason Cromer (on the DL since the beginning of the season). Maybe he’ll show up to fill in one of those slots. Maybe the guys over at RaysProspects would like to speculate on who might get called up or swapped for Heath Phillips. Or maybe the Rays will troll around the Independent Leagues. An FYI: John thought the late-inning Wool E was a replacemnet, said the original was a lefty, and the bull last night threw right-handed. If the rumors that Seattle is the main team interested in Blalock, I don't expect his release/trade (assuming he doesn't just get called up) until after the series between Seattle and Tampa this weekend. It was definitely a replacement Bull on Thursday. For one, he completely ignored the Toledo bench as he ran by in the first inning, which the real Wool E would not have done. And more importantly, this Wool E is about a foot shorter than the original. ...I saw the twisted leg injury. It looked more like a groin injury to me. ...I don't like how the Blue Monster didn't step in and back up his teammate after his incident. This is how dissension filters into a clubhouse. Great points, Syd. 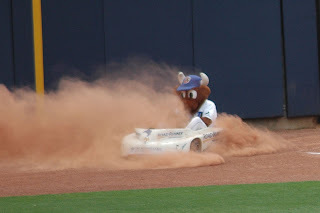 See my post today as I delve more deeply into the question, Who is Wool E. Bull?